We offer two types of shooting archery target opportunities – practice and field ranges. Each range is equipped with yardage markers and Polypropylene butts backed by hay. The practice range consists of 5 targets ranging from 20-50 yards with two bow stands and a picnic table for relaxing and enjoying the day or tuning your equipment. 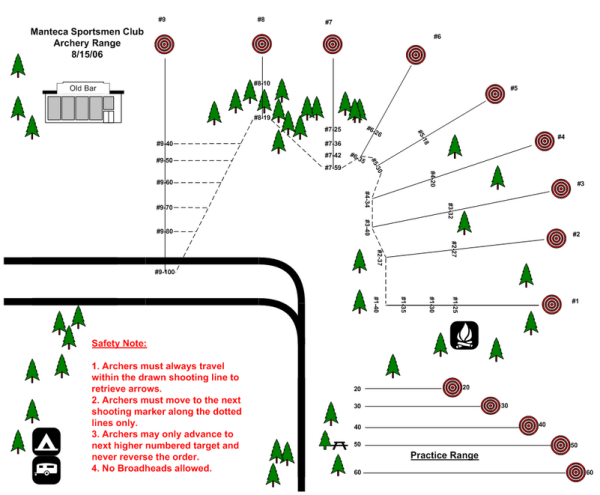 The field range consists of a 9 target walking path through some of our wooded and grassy areas with shots ranging from 10-80 yards. There are several event opportunities at our club. Archery competition and other events set up periodically based on interest. Those who are interested in participating should sign up at the clubhouse or sign up to get text messages about upcoming events and activities. Our range challenges a shooter both visually and physically. Risks are taken with all shooting sports and it is the shooters requirement to ensure safe shooting practices are observed at all times by all parties in the area. Use of the ALL CLEAR command is found to be the safest way to ensure the safety of others prior to letting loose an arrow. Unsafe situations are the responsibility of those in the general area to respectfully report to the persons committing an unsafe act and to the clubhouse or range safety officer immediately. No Broadheads or crossbows are allowed unless authorized during a club sanctioned event. Please respect others and our club by maintaining a clean environment.